Preliminaries. Ranks and Incomplete Types. Global Theory. Prime Models. More on Types and Saturated Models. Saturation of Ultraproducts. Construction of Models. The Number of Non-Isomorphic Models in Pseudo-Elementary Classes. Categoricity and the Number of Models in Elementary Classes. Classification for FaNo-Saturated Models. The Decomposition Theorem. The Main Gap For Countable Theories. For Thomas the Doubter. Appendix: Filters, Stationary Sets and Families of Sets. Partition Theorems. Various Results. Historical Remarks. References. 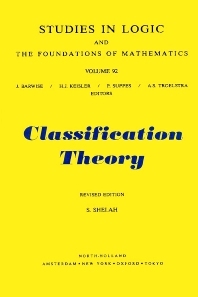 In this research monograph, the author's work on classification and related topics are presented. This revised edition brings the book up to date with the addition of four new chapters as well as various corrections to the 1978 text. The additional chapters X - XIII present the solution to countable first order T of what the author sees as the main test of the theory. In Chapter X the Dimensional Order Property is introduced and it is shown to be a meaningful dividing line for superstable theories. In Chapter XI there is a proof of the decomposition theorems. Chapter XII is the crux of the matter: there is proof that the negation of the assumption used in Chapter XI implies that in models of T a relation can be defined which orders a large subset of m|M|. This theorem is also the subject of Chapter XIII.